Most adults spend upwards of 50 hours per week looking at a digital screen. 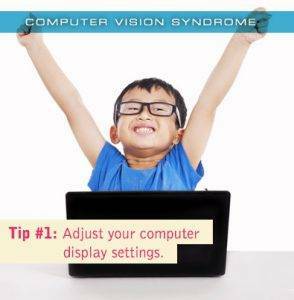 Of those that do, almost 50% reported symptoms of eye strain and eye fatigue related to their screen time. 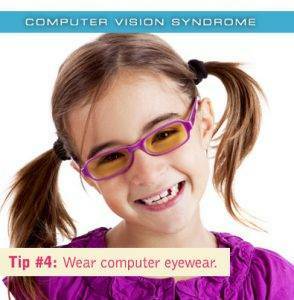 Computer vision syndrome affects children and adults alike, and is even more common in adults over the age of 40. Blue light is part of the natural spectrum of light. Like UV rays, blue light has been implicated to cause damage over the long term to your eyes such as increasing the chance of developing age related macular degeneration which is the number one cause of blindness in Americans over the age of 60. Blue light has became a major concern for optometrists as the prevalence of digital device usage increases. Digital devices often contain a large percentage of blue light, and the blue light is more focused as the light source is much closer to our eyes. To prevent eyesight damage from blue light consider blue light lens coatings for your regular glasses or computer glasses. These coatings filter out the harmful blue light in much the same way that quality sunglasses filter out harmful UV rays. An easy way to alleviate some of the strain on your eyes caused by digital device use is to tweak the settings to ensure maximum comfort. If you have an older screen called CRT, which are usually larger than the more modern LED or LCD screens, consider upgrading. The older technology has a lower refresh rate which causes additional strain on your eyes. Your screen should be as bright as the rest of your room, to test this look at a white part of your screen and see if it looks like a light source or just the color white. Adjust the contrast and color of your screen. This is especially important for people who spends significant time periods reading text on their computer. Adjust the color temperature on your screen to minimize blue light. On some newer computers there is a feature that blocks blue light, on most screens this is done manually. You can find the settings in the control panel for Windows or the system preferences for Apple. When we focus on a computer, TV or phone for long periods of time we blink a lot less frequently. Blinking is a crucial physical process as it hydrates the eyes by creating natural lubrication. 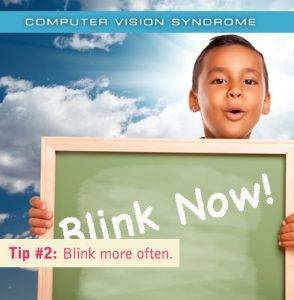 According to researches we blink 60% less while engaged in using computers. The lack of blinking causes dry eyes which according to doctors at the Houston Medical School is a major contribution to computer vision syndrome. A feeling of something in your eye often described as a sandy or gritty feeling. 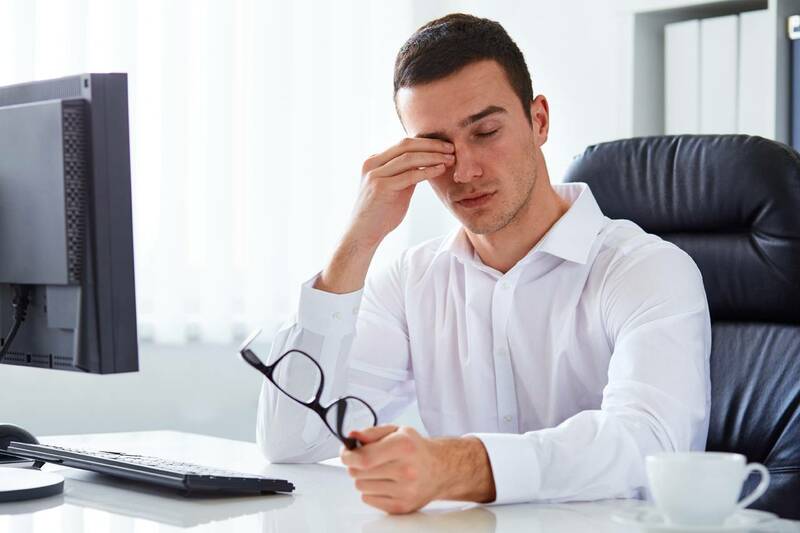 To reduce strain on your eyes and prevent dry eye symptoms our eye doctors recommend that anyone using a computer, TV, cell phone, or tablet should follow the 20-20-20 rule. 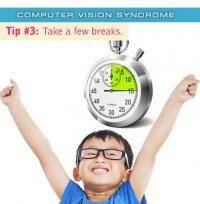 Additionally recent research has shown that people who work on computers all day had significant reduction in symptoms from computer vision syndrome when they partook in four mini breaks during the course of the work day. Each break in the study consisted of 5 minutes away from a digital device. Because hydration is important for keeping our eyes moist and comfortable, grabbing a glass of water during the break is an excellent idea. Our regular glasses are not designed to provide the optimum viewing angle for computer use. Normal eyeglasses allow for a wide range of viewing from close up work like reading the morning newspaper to distance vision like driving. When we are at a computer we tend to use almost exclusively intermediate viewing, with the normal computer 20-30 inches from our eyes. Computer glasses are designed for your eyes to provide the best vision at mid range. In addition to the viewing distance, they normally include anti reflective coatings to prevent glare from your computer screens. It is also recommended to purchase blue light filtering coatings which prevent damage from the blue light found in your computer and cell phone screens. If you use computers or smartphones or other digital devices, ask us about help when you come for your yearly eye exam in Colorado Springs at Executive Park Eyes. Or if you’re concerned, book a consult with the doctor now.